March 24, 2015 - THE HIGGINS & PICKERING EFFECTS -- Talkback Tuesday series considers Professor Higgins & Colonel Pickering's roles as teachers and mentors. Hear a panel of local leaders who manage opportunity-development programs and whether PYGMALION resonates and reflects their experiences today. March 31, 2015 - REFLECTIONS ON ELIZA -- Liberated woman? Caged bird? What's to become of Eliza? Join our panel of women leaders reflecting on Eliza, her allies, feminism and access to more resources. April 7, 2015 - ARE THE POOR REALLY DO-LITTLES? -- Explore how Alfred Doolittle and Eliza Doolittle give a picture of the urban English poor of a hundred years ago. The panel also explores current challenges with the rising wealth gaps in the United States - and hopes of Los Angeles County's poor and working class residents. The Georgia T. McClay Friendship Center at The Pasadena Playhouse hosts interactive exhibits, dramaturgical material and conversation surrounding the Main Stage productions. Running March 17 - April 12, 2015, artist and spatial designer Ellen L. Sandor invites guests to come explore the Pygmalion myth and the era of George Bernard Shaw's play through photos, archival material and other visual images (Fans of Downton Abbey may recognize the era where the play is set.) Sandor uses Shaw's words and contemporary questions to provide patrons with an opportunity to explore how language impacts access today. This is a free exhibit that is open to all patrons free of charge one hour before performance time and 30 minutes after the show. 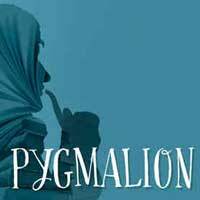 Post-Show at The Playhouse on Sunday, March 29 following the 2:00pm performance of PYGMALION features members of the cast, crew and artistic team and breaks down the barrier between the audience and the artists. Participation of the artists is completely voluntary. The Playhouse thanks them for sharing their time, talents and providing audience members with a glimpse into the theatermaking process. This event is free to patrons who have purchased tickets to the performance preceding the talk-back. The Pasadena Playhouse is located at 39 South El Molino Avenue, Pasadena, CA 91101. The performance schedule is Tuesday through Friday at 8:00 p.m.; Saturday at 4:00 p.m. and 8:00 p.m.; and Sunday at 2:00 p.m. and 7:00 p.m. Tickets, priced from $30.00 to $75.00, plus premium seats at $125.00, are available online at PasadenaPlayhouse.org; by calling The Pasadena Playhouse at 626-356-7529; or visiting The Pasadena Playhouse Box Office, Tuesday - Sunday from 1:00 p.m. until 6:00 p.m. during non-performance dates. Tickets for the High Tea at The Playhouse and the Floral Arrangement Workshop may also be purchased online, by phone, or in person at The Pasadena Playhouse Box Office. On performance dates the Box Office is open Tuesday - Saturday from 1:00 p.m. - 8:00 p.m. and 1:00 p.m. - 7:00 p.m. on Sunday. For more information, visit PasadenaPlayhouse.org.